Customize your gondola display with attractive shelving! Add shelves to your gondola display for additional merchandising capabilities. 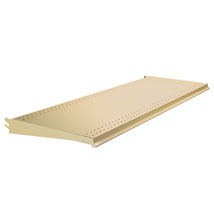 Shelves adjust to straight, 15, or 30 degree angles. Combine with gondola dividers and fencing to create several merchandising options. Can be used on the Madix and Lozier gondolas.